Yes, sir. Yes, sir, one bag full! From front to back: Loredo, Merlin, Brittany, Dianna (hidden), and Morocco. Wait. Alpacas don’t go “baa”. “Mmm Mmm Brittany, have you any wool?” just doesn’t have the same ring though. Mom and Dad sent over pictures of our roving this morning! 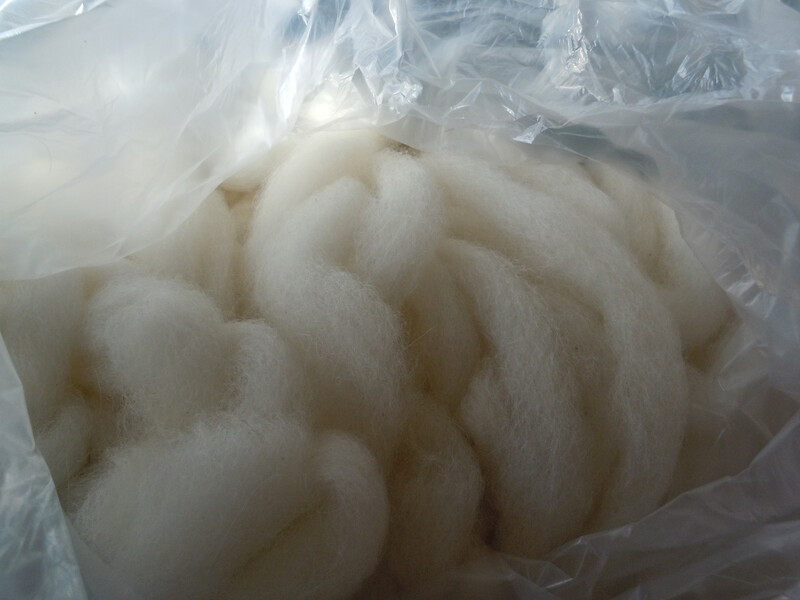 We have five bags of roving just in from the mill, totalling almost 10 pounds of yummy un-spun fiber. Morocco's slightly orange tinged white roving is a highlight. I can’t wait to work with Morocco’s fiber! 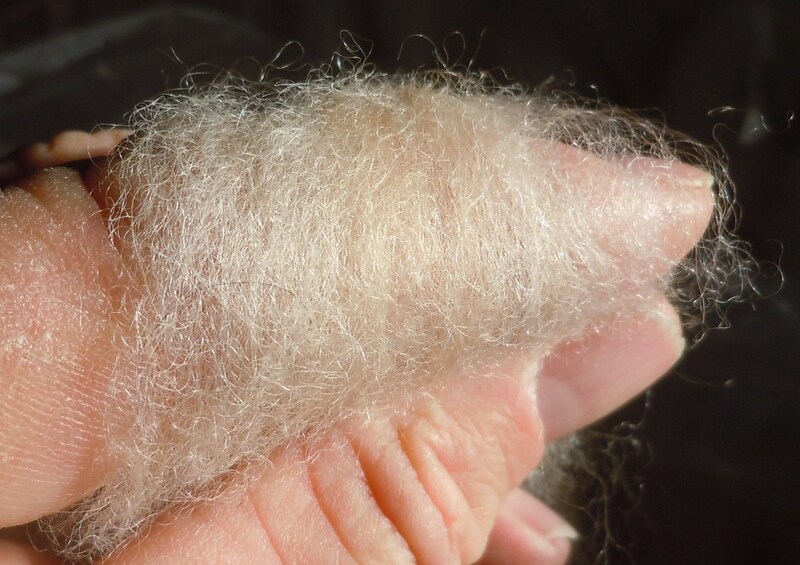 It is the softest and most brilliant of our alpacas’ fiber. To get a feeling for how luminous a fiber is, bend a small amount around your finger in bright natural light. Over the Easter holiday, I’ll head down to the ranch to pick up my share. My Aunt Geri, who has been spinning alpaca fiber, will also get some of the fiber. We have black, white, off-white, and grey to choose from; it’s going to be fun! This entry was posted in completely unrelated, fiber art and tagged alpaca, fiber, fleece, lullabies, mill, nursery rhymes, roving, sheep, wool. Bookmark the permalink. 3 Responses to Baa baa Brittany, have you any wool? You should click on the images to get the full resolution of picture. It really shows how the fibers look. This is SO exciting – I think that I am the “…little one that lives down the lane…” and I cant wait to get some! Gordon is right – clicking on the pics really shows the brilliance! Most definitely. It’s a long lane, but you live down it. And the speed limit is 75 for much of it, thankfully! 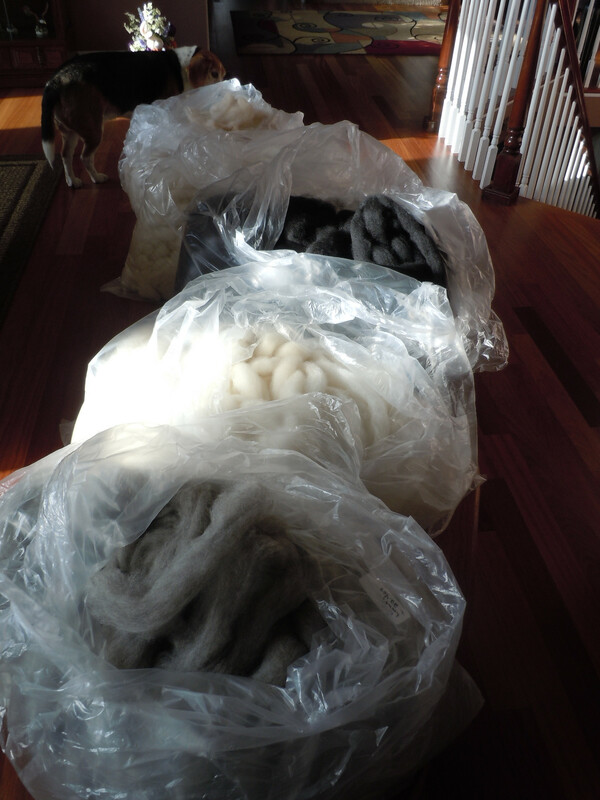 It is inspiring to have all that yummy fiber just waiting to be spun!